It’s snowing again today as I write this, and the birds are busy seeking out food that’s being quickly covered by the fluffy white stuff. 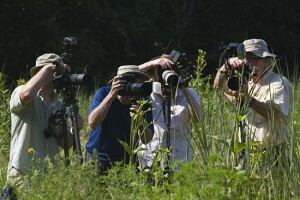 Richard’s in his photography blind again out by the juniper trees behind the birdbath. With high gas prices, it’s nice that he doesn’t have a long commute to work. 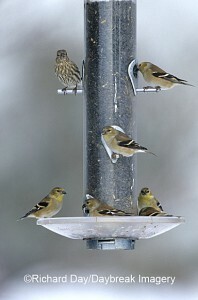 We have several feeding stations around the yard with just about every type of feeder there is. 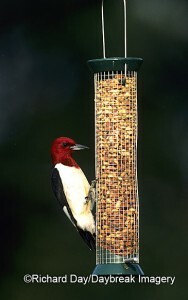 Some birds like to eat from the hanging tube style feeders and others prefer to sit on tray or hopper feeders. 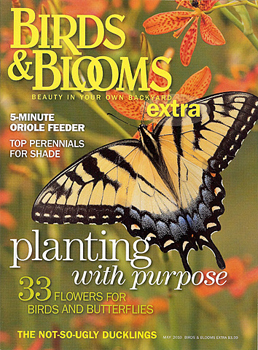 Still others eat the seeds we scatter on the ground for them or that fall below the hanging feeders. 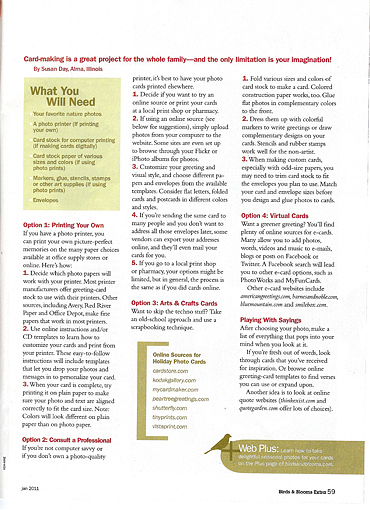 About ten years ago when Richard was gone somewhere on a photo trip, I got frustrated with the squirrels eating more bird seeds than the birds. I went to the Wild Birds Unlimited store in Swansea, Illinois and came home with two of their fancy feeder pole systems complete with squirrel baffles. They did the trick! Through the years, we’ve purchased several more of these pole systems so now most of our feeders are safe from squirrels and other nighttime feeder thieves like skunks, opossums, cats, and raccoons. They seemed expensive at the time but probably not in the long run with the money we’ve saved from feeding small mammals—and from replacing the feeders that they damaged or destroyed! Water is just as important to birds in winter as in summer because birds need to keep their feathers clean and groomed in order to fly. We have an in-ground water feature (see photo at left) with a floating cattle tank heater to keep the water from freezing. 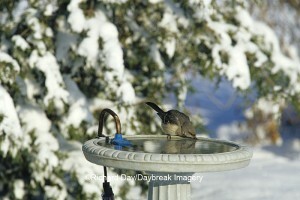 We also use special bird bath heaters, such as in this mockingbird photo, for standard pedestal bird baths. Surprisingly, these baths are just as popular on the coldest day of the year as on the hottest one in summer! 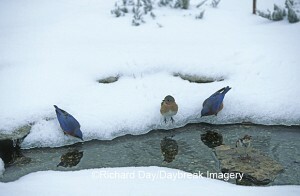 When everything else is frozen, our bird baths are the only open water around and the birds know it. After Christmas each year, Richard takes our tree outside and uses it for shelter for the birds from cold winds and storms. He places it on the south side of the cedar and spruce trees south of our office. This offers additional winter cover for the birds and also shields the feeders from winds so the birds have a sheltered area to eat. The tree in the foreground on the right side of this photo is a recycled Christmas tree propped up with rebar. In a few months we’ll take it to Stephen A. Forbes State Park where it will be placed in the lake to enhance fish habitat. 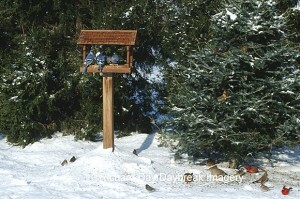 Evergreens also provide winter shelter for birds to roost at night or just to get out of the cold. Plus birds look pretty sitting in them when it snows! 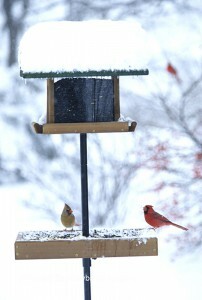 Feeding birds in winter is enjoyable. Most of our feeders are at stations outside our office windows so we can birdwatch as we work. It snowed here over the Christmas holidays and while Richard was outside photographing birds in the snow, I stayed inside holding down the fort in the office. 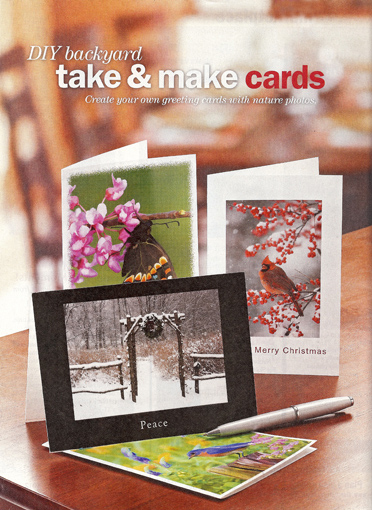 I’d take my computer-side breaks from captioning and keywording photos and gaze out my window at the birds. Sipping my cup of Trader Joe’s Bay Blend coffee laced with white chocolate mocha, I watched as the cardinals, juncos, woodpeckers, and chickadees would take their turns at the treats we provide for them. We offer a variety of seeds, nuts, suet, and fruits, because just like different people prefer different foods, so do birds. 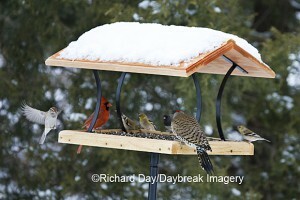 And since not all birds will eat at the same style of feeder, we own an array of feeders for every picky feathered eater. 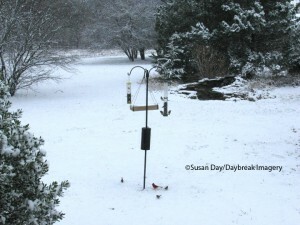 Suet is a big hit here in winter as birds tank up on energy foods to keep them warm. 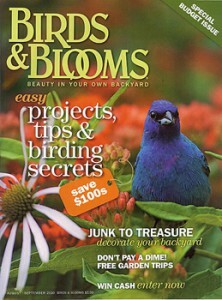 Our birds prefer C&S Brand Peanut Treat that we put in wire basket feeders. I also buy large grocery bags of beef suet from our butcher at Nuxoll’s in Effingham that we cut into chunks and stuff into suet feeders. Woodpeckers will eat suet all year, but when it’s cold outside, Tufted titmice, Carolina chickadees, White-breasted nuthatches, Carolina wrens, cardinals, and more take their turns on the fat-feeders. 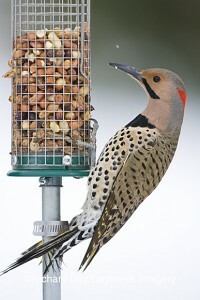 Our birds, especially the woodpeckers, go through 50 pounds or more of peanuts each winter. We serve them in hanging wire peanut feeders. We buy raw,unsalted peants in bulk and store them and the beef suet in our deep freeze. Seems like half of my freezer is for the birds! I also make a special mixture that we put in the two small feeders that are attached to our office windows with suction cups. This brings the birds really close as they are only about 3 feet away from where I sit at my computer. I chop peanut tidbits in my food processor, and mix with sunflower hearts, nyger/thistle seed, safflower, and a premium blend that contains chopped dried fruits and nuts for birds. 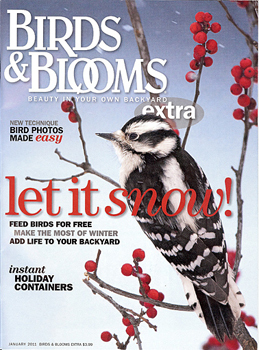 Check back in a few days for Part 2 of this Winter Birdfeeding Series on our blog! 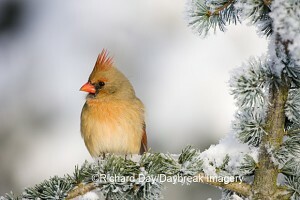 Posted in Birds, Butterflies, Gardens, Photo Workshops, Seasons | Comments Off on Welcome to the Daybreak Imagery Blog!